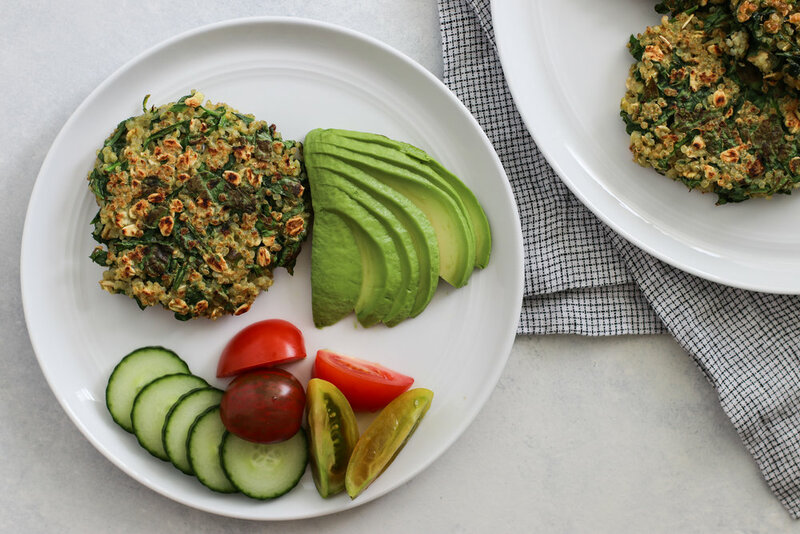 Spinach & Quinoa Patties — Erin Parekh | Live Well, Simply. I make these patties whenever I have leftover quinoa from the week that needs to be eaten. The recipe is easily scalable and forgivable, so use whatever amounts you have. My favorite way to serve them is on top of a big salad with lots of avocado and some hummus. Cook the quinoa: Place 2 cups water, rinsed quinoa and a pinch of salt in a medium-size saucepan. Bring to a boil, lower the heat to a bare simmer, cover, and gently cook for 15 minutes, or until you see small tails on the quinoa seeds. Turn off the heat and let sit, covered, for another 10 minutes. Fluff with a fork and set aside to cool. In a large mixing bowl, combine cooked quinoa, oats, eggs, shallot, chopped spinach, salt and pepper. Make sure it's very well mixed. Place in the fridge to set for least 30 minutes. When ready to cook, remove the mixture from the fridge and form 10 to 12 patties with your hands. Heat 1 tablespoon oil in a nonstick frying pan on medium heat. Add the patties, several at a time, being sure not to crowd the pan, and fry for 2-3 minutes on each side or until golden brown. These will keep for 3-5 days in the fridge and freeze well. A note on forming the patties: The batter is very loose. I find it's easiest to make balls and then flatten/form them with my spatula once their on the skillet. To chop spinach, I use a food processor. You can also place spinach in a bowl and use kitchen shears to finely chop.